DESCRIPTION Butterflies with hearts for wings. DETAILS This is my rendition of a valentine butterfly. The one you make should be what you create. There are so many possibilities - using glitter, markers, crayons, paint, colorful things cut from magazines, self stick round Avery labels in colors. 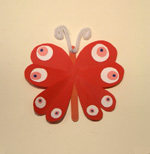 Real butterflies come in a variety of designs. So should yours. I decided my butterfly would be about circles. I cut two sets of hearts from red paper for the wings and glued them on a popsicle stick. Then I traced around my glue stick for the big circles, cutting them from white paper. My magic marker provided the pattern for the next sized circles on the bigger wings. These were cut from pink paper. The smaller pink circles were done with a hole punch. The blue dot is magic marker. I glued them all together with a glue stick which required some dexterity. The antenna are twisted pipe cleaners. MATERIALS NEEDED Colored paper, glue stick, popsicle sticks, scissors, pipe cleaners.